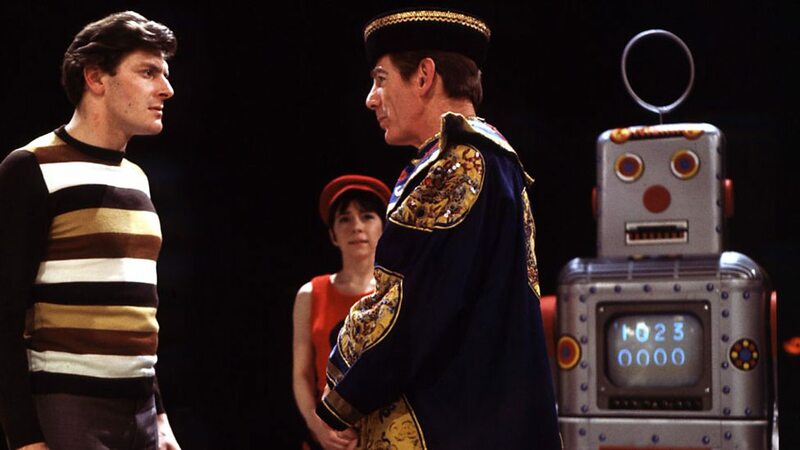 Eclecticism, endurance and The Celestial Toymaker (1966) | Randomwhoness: a Doctor Who blog by Johnny Spandrell. Sampling stories in random order. I expect whether or not you enjoy The Celestial Toymaker is down to how tolerant you are of being shown the same episode four times. The pattern goes like this: the Doctor (a partially absent William Hartnell) is off playing an elaborate board game with the Toymaker (Michael Gough), sometimes without form and/or voice. Meanwhile Steven (bolshie Peter Purves) and Dodo (chirpy Jackie Lane) play out a twisted version of a children’s game against opponents pulled from the Toymaker’s eclectic collection. The opponents prove to be cheats, our friends win through and on to the next episode. It’s only brought to an end in the fourth episode because it’s got to end sometime. If they could have convinced Hartnell to go on six weeks holiday they probably would have kept going. Repetition aside, there are a few other problems with this structure. Firstly, the games themselves are inherently undramatic. Deadly tricks and conniving opponents have to be enlisted to ramp the drama up. Judging by the surviving fourth episode, The Final Test, it’s also a challenge to direct them with any flair or tension. Also, the rules of each of the games have to be explained again and again, to, it must be said, tedious effect. Then there are the limitations it sets on character. With nothing to do but play the games, and explain the rules to each other, and bicker between themselves and their opponents, Steven and Dodo quickly become tiresome company. Steven is irritatingly truculent with everyone he meets and Dodo is so gullible and naive as to make you wonder if anyone checked the script for internal consistency before sending it to the rehearsal room. By the time you get to the fourth episode and she’s in the middle of a deadly game of hopscotch, she’s still getting lines like “I think I’m going to enjoy this game” – despite the last three almost killing her and Steven – you start to think none of this story’s many writers were paying attention by this late stage. So although there’s little to enjoy about the games themselves, there is some interest generated by the miscellany of characters the Toymaker sends into bat. The most noisome is Cyril (Peter Stephens), who the Toymaker says is the most deadly because he seems so innocent. Nothing about a middle aged man dressed as a schoolboy says innocent to me, but there you go. He appears late in the story, and being such a snide little oik, the viewer finally does want Steven and Dodo to kick his arse and win their latest pointless game. The most successful of the episodes is the second, The Hall of Dolls. In this instalment, Steven and Dodo are confronted with the Heart family, plucked from a deck of playing cards. Together, they play a game of deducing which one of seven chairs is safe, by testing the other six firstly with lifeless dolls and then when they run out, with themselves. Apart from the interest generated by discovering if the chair is going to stab you, freeze you or whatever, there’s also the hint that the games might be corrupting Steven and Dodo. When they find a few extra dolls to use as chair fodder, Steven is keen to keep this information from the Hearts. Sadly, though this potentially interesting plotline goes nowhere. Still, the King and Queen of Hearts (Campbell Singer and Carmen Silvera) are the most intriguing of the Toymaker’s playthings and there’s something approaching poignancy when they decide to sit in the last possible, but deadly, chair together, in a last gambit for victory. As for the Toymaker himself, well, he’s an odd fish. He dresses like a Chinese mandarin, for reasons never explained, but he’s played by plummy Michael Gough, with a voice that can cut glass. Unusually for Doctor Who, he’s a comic book super villain, complete with elaborate costume and a title for a name. If he made an appearance on Batman (Holy playtime! ), it wouldn’t surprise. He spends a lot of time talking to the mute, disembodied Doctor; that’s about two episodes of one sided conversation which is difficult to sustain. Particularly when all the conversation is about is haranguing the Doctor for not playing his game fast enough and running a commentary on the sedate adventures of Steven and Dodo. Despite its various problems though, The Celestial Toymaker has stuck in our collective memory. Perhaps because it’s the most unusual of adventure of Season Three, which is some feat when you consider that eclectic collection of stories. Perhaps it’s the most unusual of Doctor Who’s first five years, only to be outdone for weirdness when that pesky Mind Robber came along. But where the stories around this one, The Ark and The Gunfighters, are playful with narrative structure, The Celestial Toymaker is playful only with character and setting; the actual storytelling it employs is pretty standard. Even so, the Toymaker has proved an enduring creation, very nearly returning to the series in 1986, and making return appearances in books, audios and comic strips. We’re not done with him, it seems. And I often think he’s a ready made candidate for a starring role modern day Christmas special (although no doubt they’d do away with questionable appropriation of dated oriental motifs, as skewered so expertly by Phil Sandifer). Though lord only knows what sort of modern day games they’d be able to drag Bill and Nardole through. A deadly Pokemon Go, I suppose. Or a real life Crossy Frog. While Capaldi and the Toymaker (Miriam Margoyles, if I had any say) duel it out on Guitar Hero. If a return visit from the Toymaker seems overdue, or even if it doesn’t, we should remember that there’s an alternative universe in which he’s a much more important figure in Whodom. The original plan was for the Doctor to become invisible and then reappear as a new actor. We can all be grateful the production team went in another direction and found a more generic renewal to subject the Doctor to. For one thing, it would have been a shameful way to treat William Hartnell. But for another, surely every subsequent change of lead actor would have required return visits to the Celestial Toyroom? Not just the same episode four times, but presumably the same story again and again. A game we’d tire of playing pretty fast. LINK TO The Doctor’s Daughter: both feature the Doctor’s disembodied hand. NEXT TIME: Jurassic emergency! The Doctor frowns himself a new face and we take a Deep Breath.